We recently improved Ecwid’s order status listing to make them more descriptive. The new order status set will help existing and new Ecwid merchants by making order management easier for them and their customers. As always, this update is designed to improve your e-commerce experience! Please read along to see all implemented changes. Queued indicates the order was placed successfully, but the merchant has not received any funds. All orders placed using offline payment methods (such as phone ordering, wire transfer, etc) are listed as this status by default. Accepted indicates the merchant has charged the customer for an order. All successful orders placed using payment gateways (e.g. PayPal, Stripe, Authorize.Net, etc) are listed as this status by default. Chargeable indicates the merchant can charge their customer for the order. Declined shows the selected gateway has failed to authorize or charge the customer’s transaction. Canceled indicates the merchant has canceled the order. 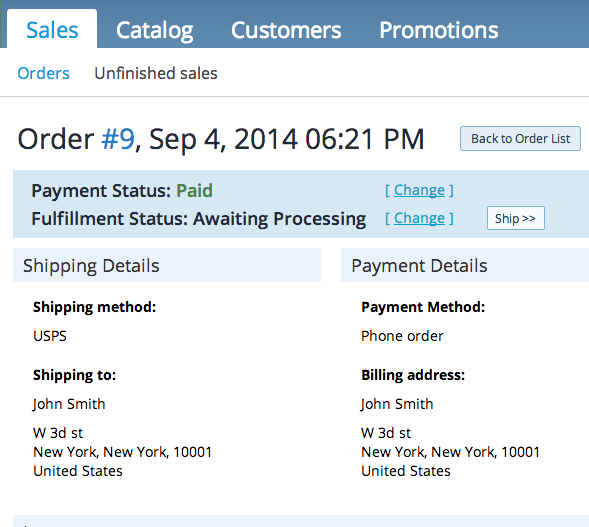 New is the default fulfillment state for all new orders. Processing indicates the merchant is in the process of fulfilling the customer’s order. Shipped indicates the merchant has already shipped the order. Delivered confirms that the order has been delivered. Will not deliver indicates the merchant will not ship the items to the customer. We decided to improve this scheme. 1) There is confusion in the existing order status set. For example, merchants and customers might not understand the Queued payment status at first glance. Why is it queued? Where is the queue? 2) Some statuses are rarely used. This results in an increase in the complexity of order management without adding much value (e.g. Chargeable). 3) There are common order processing stages which are not accounted for in Ecwid’s current order status set (i.e. refunds and returns). Various circumstances result in order cancellation, however, all cancellations ultimately lead to the same outcome for the merchant and customer. The method by which a merchant must address these cancellations differs between each scenario. In the case of a refund, the merchant needs to get in touch with their customer to explore the troubles they faced and initiate a refund to their bank or payment processor. Each refund should be treated as a possible problem with the product and/or service the merchant offers. For this reason, we decide refunded and returned each deserve their own status to allow merchants to better track their sales and react to any possible issues. The new names better describe whether the money has been received from customer. This update is sure to clarify each status for both the merchant and the customer. Although an order becomes Declined or Canceled under different conditions (declined is set by the payment gateway while Canceled is set manually by store administrator), the store owner sees both as a canceled order. Now, the formerly independent Declined status appears as Canceled. We’ve been studying how Ecwid merchants use order statuses for a long time. From our experience, we conclude the Chargeable status is redundant because it is either Queued or Awaiting Payment. To eliminate unnecessary complexity, Chargeable no longer exists as a separate status. Please use the Awaiting Payment status instead. Similar to Awaiting Payment in the payment status list, Awaiting Processing will say much more to merchants and customers about state of the order rather than New. Refunded and Returned are enabled and already work for all Ecwid users. You can start using them right now! We understand the importance of making the migration as seamless as possible for our users. For this reason, the migration will be applied in the following way. New users who register after August, 15 2014 will have all the new order status set as described. This is automatically enabled and does not require the merchant to enable the setting. All existing users are provided with activation and deactivation options to update the status labels in their Ecwid backend. The migration option is available in your control panel under System settings → Migrations. How will the migration affect my store and my existing workflow? All existing users have an option to switch between old and new schemes (there is a migration option). If you are not ready to go with the new order status set yet, you can use the old ones as mentioned above. Ecwid API v1 will continue working as usual, so the changes will not break any third party apps connected to Ecwid. The new scheme is simultaneously supported by our API, so the developers will support the new status set in their apps to provide better user experience. We improved the order status set in Ecwid to make them more descriptive and Ecwid’s order management process better. The new scheme is already available for all Ecwid merchants. We made it enabled by default for the new users and encourage all existing merchants to migrate to the new scheme in their store settings. The new statuses a way more convenient and we believe you and your customers will see instant benefits.